This course is designed for public health staff who are experienced in conducting tuberculosis contact investigations and may also be tasked with overseeing and/or training other staff in conducting contact investigations. This foundational course is designed for public health staff who have recently been given the responsibility for conducting tuberculosis contact investigations. This course is designed for physicians, nurses and health care professionals who work with patients with or at risk of tuberculosis. The goal of this course is to provide an introductory training experience covering basic elements, knowledge and skills essential for the registered nurse or LVN/LPN responsible for the care of patients with active TB disease and their contacts. The course will provide new nurses with the foundation necessary to attend Heartland's TB Nurse Case Management course. Participants must complete the CDC Self Study Modules 1-9 and present a Certificate of Completion prior to the first session. This course is intended for the health care professional with little to no experience in conducting a TB contact investigation. Participants must complete the CDC Self Study Modules 1-5 & 6-9 and present a Certificate of Completion prior to the first session. This course is intended for physicians, nurse practitioners, and registered nurses with direct experience in the management of patients, with, or at risk of TB. This is not an introductory course. It is required that nursing participants have a minimum of one year experience in TB case management and attend the TB Nurse Case Management course prior to attending TB Intensive. This webinar is intended for the prescribing physician and healthcare staff who may be involved with the decision to utilize an interferon gamma release assay (IGRA) test in screening individuals for tuberculosis. Tuberculosis (TB) prevention and control has traditionally been a core function of public health departments, with nurses at the forefront. However, many of those at high risk for TB infection and TB disease who need to be tested and treated receive their care from private health care providers and community health centers. As in public health departments, nurses in these settings play a critical role in the diagnosis and treatment of latent TB infection and TB disease, as well as in the prevention of TB transmission through infection control practices. This course is intended for the nurse with primary responsibilityfor TB case management. This course is designed for physicians, nurses, and healthcare professionals who work with patients with or at risk of tuberculosis. This 90-minute webinar will provide practical implications of the recommendations in the "2016 Official American Thoracic Society/Centers for Disease Control and Prevention/Infectious Diseases Society of America Clinical Practice Guidelines: Treatment of Drug Susceptible Tuberculosis" to guide clinical decision making. This webinar will discuss implementation of the guidelines from various TB program settings. The Handbook of Child and Adolescent Tuberculosis is a state of the art clinical reference written and edited by the world's leading experts in childhood tuberculosis. It offers clinicians in any geographic setting practical, evidence-based advice on all aspects of the disease, including its natural history, epidemiology, presentation, treatment, and prevention-all in a format that synthesizes literature with the clinical experience of the leading authorities in this challenging field. This course is intended for college health professionals seeking to increase patient satisfaction in the areas affecting todays college campuses. The TB Education and Training Network (TB ETN) is pleased to invite you to a National Webinar highlighting exciting and unique local-level TB education and training projects. Don't miss this opportunity to learn about what is happening on the ground in TB education and training. Continuing education credits will not be offered for this activity. This training is jointly sponsored by the Curry International Tuberculosis Center, Heartland National Tuberculosis Center, Mayo Clinic Center for Tuberculosis, Rutgers Global Tuberculosis Institute, Southeastern National Tuberculosis Center and The Union. The training will take place in association with the The Union-NAR / NTCA Joint 20th Annual Conference and is an official pre-conference workshop. TBeat December 2015 is now available for download! In the last century, the United States has transi? ?oned from a high to a low tuberculosis (TB) incidence country. A major factor in this decline has been the emphasis on identification and treatment of patients with tuberculous infection. On February 21, 2012, the San Antonio Metropolitan Health District (SAMHD) Tuberculosis Clinic was notified that two students at Madison High School had laboratory-confirmed pulmonary tuberculosis (TB). Per US Census Bureau, the estimated population for the state of Louisiana (LA) was 4.65 million as of 2014. 63% of the population is white and 32% black, 1.8% Asian, and 4.8% Hispanic or Latino. CNE, CME, CEU application pending. Provide opportunity for collaboration and networking with other college health professionals. Develop personal growth for the caregiver and learn how to increase patient satisfaction. Over the past year, we have engaged in a review, revision and consolidation of the Division of Tuberculosis Elimination's (DTBE) strategic planning documents. I am pleased to share with you the product of these efforts: DTBE's 2016-2020 Strategic Plan (http://www.cdc.gov/tb/about/strategicplan.htm), which aligns with the "National Center for HIV/AIDS, Viral Hepatitis, STD, and TB Prevention (NCHHSTP) Strategic Plan Through 2020." Six specific strategies provide the framework for DTBE's strategic plan. These strategies are derived from the U.S. government's response to the Institute of Medicine Report, "Ending Neglect: The Elimination of Tuberculosis in the United States" (2000) and were reaffirmed in "A Call for Action on the Tuberculosis Elimination Plan" published by STOP TB USA in 2010. DTBE's 2016-2020 Strategic Plan details how the division's activities, objectives and targets align with the six strategies, all of which are aimed at the overall goal of reducing tuberculosis morbidity with special attention to addressing health disparities. I would like to thank NCHHSTP and DTBE leadership and staff, as well as our partners, for providing essential input during the revision process. We look forward to continue working with you on our joint mission to promote health and quality of life by preventing, controlling, and eventually eliminating tuberculosis in the United States. This is the seventh year the National TB Controllers Association (NTCA) will honor individuals or organizations for their dedication and distinguished service in the field of tuberculosis. Nominations can be submitted by anyone and nominees do not need to be members of NTCA. Please give some thought to recognizing your colleagues by nominating them for an award. This is a great way to recognize contributions "above and beyond" in our efforts to control, and eventually eliminate, TB. The nomination form can be found below. Nomination forms must be submitted by December 12, 2015. Stop TB USA, RESULTS, Inc. and the NTCA are excited to provide you with the Applicant Form for the 2016 TB Survivor Communication Skills Workshop which will be held Feb. 22nd and 23rd at the Sheraton in Denver, CO. This training provides those willing to share their stories a chance to learn public speaking skills and how to engage not only with other survivors, but the media and those that can affect change within our government. We cannot thank you enough for taking the time to share this information and help us identify TB survivors who are willing to join us in this effort and share their stories. Application submissions due no later than, Monday, Nov. 16th 2015. Please submit completed applications via e-mail to ntca@tbcontrollers.org. Centers for Disease Control and Prevention (CDC), Division of Tuberculosis Elimination (DTBE) released provisional 2014 surveillance data on reported TB cases in the United States and is pleased to announce that the full report, entitled "Reported Tuberculosis in the United States, 2014", is now available for viewing online. This conference is designed for the correctional staff, nurse's, and public health workers who are tasked with the management of tuberculosis care. This course is designed for the TB nurses and other allied health care workers responsible for the administration and interpretation of the tuberculin skin test. This is the sixth year the NTCA will be honoring individuals or organizations for their dedication and distinguished service in the field of tuberculosis. Nominations can be submitted by anyone. 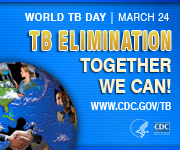 CDC has added resources to the World TB Day section on the DTBE Website at http://www.cdc.gov/tb/events/WorldTBDay/default.htm that may be helpful to you as you are planning World TB Day activities. *Webinar* Mycobacteria Series - Register for one webinar or save $60 when you register for all three! The MTPI efforts to provide important information related to the pathogenesis, host response, diagnosis, and management of lower respiratory tract infection now include a live webinar series addressing novel, controversial, and timely issues. During this hour-long webinar, Dr. Karla Thornton and Jennifer Jacovetti, RN, will share insights on how to manage TB patients who have the hepatitis C virus (HCV). TB Articles and Studies - Download published documents relating to Tuberculosis. Wallace: TB also is a killer we should be fighting - Despite the risk, an El Paso hospital employee working with newborns was kept on the job for six weeks even after showing typical signs of TB, potentially exposing 860 infants and 43 employees. Out of Step - Deadly implementation gaps in the TB response. A survey of TB diagnostic and treatment practices in eight countries. Job Summary: Under the direction of the Training and Education Director, performs highly complex administrative duties to plan, develop, coordinate, participate in and evaluate all aspects of education and training. August 13 - September 5, 2014. This course requires online and in person participation. CLOSED :: Webinar Effect of Substance Abuse on the Treatment of TB Along the Border :: June 19, 2014. On June 10, the National Society of TB Clinicians (NSTC) and the National TB Nurse Coalition (NTNC) will be holding their annual meetings. The meetings provide free educational content and CE credits. The National TB Conference follows Wednesday, June 11, to Friday, June 13. The agenda and registration information for the conference are available online at the conference website. It is with great pleasure that we invite you to attend the 2014 National TB Conference (NTC) held June 11-13, 2014, at the Grant Hyatt in Buckhead, Atlanta, GA. See conference website. The CDC, Division of Tuberculosis Elimination is pleased to announce the release of the updated Self-Study Modules on Tuberculosis, 6-9. These educational modules are designed to provide TB programmatic information in a self-study format for health care workers, including outreach workers, nurses, physicians, and health educators. The MTPI efforts to provide important information related to the pathogenesis, host response, diagnosis, and management of lower respiratory tract infection will now include a live webinar series addressing novel, controversial, and timely issues. Feedback Form - Heartland National TB Center welcomes your suggestions for improving our products. If you have an idea for a new feature or improvement to our products, please fill out the feedback form. India Warns It is Running out of TB Drug - Read the full article on the Wall Street Journal. The Federal Custody from the Federal Bureau of Prisons, United Stated Marshals Service and Immigration & Customs Enforcement has released the TB Case Management for Removable Alien Inmates/Detainees in Federal Custody. The files are available for download below. Dr. Griffith talks about LTBI. Watch the video by following the link below. This webinar is intended for TB program staff and clinical personnel including physicians, nurses, and other healthcare staff who diagnose and treat pediatric TB cases. This course is designed for the public health provider, registered nurse, correctional staff, and other health care professionals who are tasked with the management of tuberculosis control. Dr. Kenneth Castro, Director of the Division of Tuberculosis Elimination at CDC, discusses the December 9, 2011 CDC guidelines for the use of a new regimen for the treatment of persons with latent tuberculosis infection. This course is intended for nurses and public health staff who are new in the field of identifying, case managing, and treating patients with tuberculosis infection or disease. RTMCC-NSTC Pre-Conference Workshop - 16th Conference of the Union North America Region Pre-Workshop: February 22, 2012. Short-Course (3-Month) Therapy with Weekly Isoniazid-Rifapentine Is NOT RECOMMENDED for HIV-Infected Patients Receiving Antiretroviral Therapy The purpose of this supplemental information is to alert clinicians about the use of short-course therapy with weekly isoniazid plus rifapentine (INH-RPT) for the treatment of latent tuberculosis infection (LTBI) in HIVinfected patients. The CDC has released recommendations for the use of an Isoniazid-Rifapentine regimen with direct observation to treat latent mycobacterium tuberculosis infection. Please see the following link to the MMWR Weekly Report: http://www.cdc.gov/mmwr/preview/mmwrhtml/mm6048a3.htm?s_cid=mm6048a3_e&source=govdelivery. Please refer to your states website for guidance on implementation of these recommendations in your state. This webinar series is intended for the new as well as the experienced TB Program Manager who is responsible for the programmatic development, management, and evaluation of Texas TB programs. This course is intended for physicians, nurses, healthcare professionals, and support staff that are involved in the treatment or management of tuberculosis patients who are on renal dialysis. Additionally, it targets the renal dialysis nurse who would like a better understanding of how to manage their renal patient that also has tuberculosis. This course is intended for the pharmacist or non-TB staff who is tasked with the placement and reading of the tuberculin skin test. This course is intended for the healthcare worker involved with tuberculosis contact investigations as a means of prevention and control. This course is intended for physicians and nurse experts with direct experience in the management of patients with, or at risk of, tuberculosis. This is not an introductory course. It is recommended that nursing participants attend a TB Nurse Case Management course prior to attending TB Intensive. NEW PRODUCT Case Studies in TB A collection of nurse case studies and accompanying tools. REGISTRATION OPEN for TB Education and Training Network :: September 20-22, 2011 The 11th annual TB Education and Training Network (TB ETN) Conference, TB Education, Training, and Evaluation: Waves of Change, Oceans of Opportunity will be held in Atlanta, Georgia, September 20-22, 2011, at the Westin Atlanta Perimeter North. For a third year, TB ETN and the TB Program Evaluation Network (TB PEN) will join forces to highlight the common aspects of TB education, training, and evaluation. The conference will focus on a variety of topics including public health workforce development in response to health care system changes, effective health education messages, and new technology tools for TB education, training, and evaluation. Conference activities will also include skills-based workshops, informational presentations, and networking opportunities. On behalf of The National TB Nurse Coalition (NTNC), Dawn Ferrell, president of NTNC, would like to take this opportunity to provide you with information about the organization and invite you to become a member. The NTNC is a strong and active organization that plays an integral role in providing a collective voice for nurses working in TB control activities as well as an advocate for TB elimination throughout the nation. National Webinar: Behavioral Aspects of Substance Abuse (3-Part Series: Impact on Managing TB) :: May 5, May 12, May 19 2011 This course is intended for physicians, nurses, healthcare professionals, and support staff that are involved in the treatment or management of tuberculosis patients with substance abuse issues OR health care staff who work with patients with underlying substance abuse or mental illness who are at risk of, or have, tuberculosis. Nursing continuing education credit will be awarded. Contact the Lead Educator, Jessica Waguespack for more information. REGISTRATION CLOSED for Substance Abuse and TB:: Springfield, Illinois:: April 27, 2011. This course targets physicians, nurses, healthcare professionals, and support staff that are involved in the treatment or management of tuberculosis patients with substance abuse issues. The goal of the conference is to share information and strategies to enhance the treatment and management of TB among patients that suffer from substance abuse. Nursing continuing education credit will be awarded. Contact the Lead Educator, Jessica Waguespack for more information. 2011 National TB Controller Association Award Nominations Open This is the second year that the NTCA will be honoring individuals or organizations for their dedication and distinguished service in the field of TB. Nominations can be submitted by anyone, and nominees do not need to be members of NTCA. The award categories are described in the Awards Announcement. The deadline for nomination forms is April 18, 2011. Awards will be presented at the 2011 National TB Conference. Course FullTB Intensive:: San Antonio, Texas:: April 6-8, 2011. This course is intended for physicians and nurse experts with direct experience in the management of patients with, or at risk of, tuberculosis. This is not an introductory course. It is recommended that nursing participants attend a Nurse Case Management course prior to attending TB Intensive. The format for this course will include lecture presentation and case scenario analysis with audience discussion and participation. Physician and nursing continuing education credit will be awarded. You may contact the Lead Educator, Mary Long for more information. REGISTRATION CLOSED for TB Cohort Review:: Phoenix, Arizona:: March 23, 2011. This course is intended for the registered nurse case manager, program manager, epidemiologist, field staff, as well as other staff members involved in a TB Cohort Review and will introduce health care workers to the TB Cohort Review process through CDC guidelines, case examples, and group exercises. Contact the Lead Educator, Jessica Quintero for more information. REGISTRATION CLOSED for TB in Corrections:: Phoenix, Arizona:: March 24, 2011. This course targets the registered nurses and other health care professionals who are tasked with the management of tuberculosis in correctional facilities at the local, state, and federal level and will enhance their knowledge of TB prevention and control measures within the correctional setting. Contact the Lead Educator, Jessica Quintero for more information. Course Completed. TB Nurse Case Management:: San Antonio, Texas:: March 2-4, 2011. This course targets nurses and public health staff who are actively engaged in the identification, case management, and treatment of patients with tuberculosis infection or disease. The goal of the conference is to provide an in-depth training experience covering the knowledge and skills essential for the nurse with primary responsibility for TB case management. The course covers the evaluation, treatment and case management of medically and psychosocially difficult-to-treat patients. The workshop goes beyond the basic TB curriculum and enhance the participants ability to be accountable for all facets of case management. You may contact the Lead Educator, Jessica Quintero for more information. Course Completed. TB Cohort Review:: San Antonio, Texas:: February 24, 2011. This course targets the registered nurse case manager, program manager, epidemiologist, field staff, as well as other staff members involved in a TB Cohort Review and introduces health care workers to the TB Cohort Review process through CDC guidelines, case examples, and group exercises. Contact the Lead Educator, Jessica Quintero for more information. This webinar describes the epidemiologic risk factors and transmission of Mycobacterium bovis, discusses the differences between Mycobacterium bovis and Mycobacterium tuberculosis, and identifies case management best practices during treatment of Mycobacterium bovis. 2011 courses and webinars have been added to the Heartland Training Page. As more dates are confirmed with our partner states the listings will be updated. Please check back regularly. Courses with APPLY listed are open for registration. Course for Texas Residents ONLY Completed TB 202 and Field Staff Basics:: December 9, 2010 :: Houston, Texas This course is designed to enhance the medical knowledge and field practices of the the TB field staff worker in the state of Texas. Updated information will be presented on TB infectiousness, treatment, and co-morbidities. Shared discussions among participants will include field worker safety, techniques to improve patient relationships, and ways to increase DOT adherence. This 3 day seminar sponsored by Heartland was held at the Texas Center for Infectious Disease. The course emphasized best practices for working with patients with, or at risk of, tuberculosis. The target audience was the physician who manages TB patients and advanced practice nurses. This 1 day seminar was sponsored by Heartland, Oklahoma City County Health Department, Oklahoma Department of Health, and the Mid America Addiction Technology Transfer Center. The course emphasized best practices for working with patients with, or at risk of, tuberculosis who have underlying substance abuse. Course moved to 2011 - TB in Vulnerable Populations:: Chicago, Illinois This 2 day seminar sponsored by Heartland, the City of Chicago Department of Health TB Program, and the Great Lakes Addiction Technology Transfer Center has been postponed and moved to 2011. Please check back for a new date. The 10th TB Education and Training Network Annual Conference TB Education, Training, and Evaluation: Fitting the Pieces Together was held in Atlanta, Georgia August 10-12, 2010. Heartland National TB Center would like to announce the addition of Lisa Armitige, MD, PhD to our Heartland team as a Medical Consultant. Dr. Armitige is an Associate Professor of Internal Medicine and Pediatrics at the University of Texas Health Science Center at Tyler (UT-Tyler) and an Adjunct Assistant Professor of Internal Medicine and Pediatrics at UT-Houston Medical School. She received a BA in Biochemistry from Rice University in 1989, and in 1998 was the 50th graduate of the UT-Houston MD/PhD Program. Dr. Armitige pursued a combined residency in internal medicine and pediatrics (1998-2002) and completed a Fellowship in adult infectious diseases (2003-2005) at UT-Houston. Upon completion of her training, Dr. Armitige joined the faculty at UT-Houston Medical School where she taught medical students, residents and infectious diseases fellows on inpatient and outpatient clinical services. Her outpatient clinics included a full service HIV clinic and a hospital-based tuberculosis clinic in Harris County, Houston, Texas. Her research interest is pathogenesis of Mycobacterium tuberculosis. Studies in her laboratory have included investigations of M. tuberculosis virulence factors and correlates of bacterial behavior with human host response. Dr. Armitige has published several abstracts and peer-reviewed articles in her field. Dr. Armitige has numerous awards which include the 2004 UNCF/Merck Postdoctoral Science Research Fellowship Award, the 2004 Infectious Diseases Society of America Bayer Harold Neu Postdoctoral Fellowship Award, the 2006-2007 UT-Houston Dean Teaching Excellence Award, and the 2010 Benjy F. Brooks Teaching Award from UT-Houston. While in Houston, Dr. Armitige many teaching responsibilities included roles as Preceptor for the UT-Houston second-year Fundamentals of Medicine course (1999-2003, 2006-2008), Faculty Advisor for the UT-Houston first-year Immunology course (2003-2009); she was voted Best Teacher Clinical Immunology(2006-2009), Lecturer for the UT-Houston first-year Microbiology course (2004-2010); she was voted Best Teacher Microbiology in 2004-2009, and Facilitator for the UT-Houston second-year Problem-Based Learning course (2007-2009). Dr. Armitige holds membership in the following professional societies: American Society for Microbiology, Infectious Diseases Society of America, American College of Physicians, and is a Fellow of the American Academy of Pediatrics. You may contact Dr. Armitige at 210-531-4548 or lisa.armitige@dshs.state.tx.us. Heartland National TB Center would like to announce the addition of Robert Granger, MPH to our Education and Training team as an Education Specialist. Coming to San Antonio from Morgan State University in Baltimore, Maryland, Robert is a native Floridian who attended the University of Florida where he received a Bachelors of Science in Health Education and Behavior, with a concentration in Health Promotion. While an undergraduate, Robert developed an interest in chronic disease prevention. Prior to graduation, he completed two internships in personal training and diabetes education. Robert has recently completed his Masters in Public Health with a concerntation in Behavioral Health Sciences. Prior to graduate school, Robert worked at the Florida Department of Health as a Health Education Consultant for the Bureau of Chronic Disease and Prevention. His desire to promote chronic disease prevention in underserved population groups led him to pursue a Masters degree in Public Health from Morgan State University. During his matriculation of the program, Robert developed an interest in program planning and evaluation and subsequently selected Behavioral Health Sciences as his concentration. For his practicum experience, he planned and implemented a pilot program entitled P.L.A.Y. at Morgan which is a five-week summer program designed to gain insight on the strategies needed to develop successful obesity intervention for African American adolescents. You may contact Robert at 210-531-4509 or Robert.granger@uthct.edu. The 2010 National TB Conference presentations submitted by session speakers are available to download. Visit the Conference webpage for the archived presentations. Click the scheduled day of the presentation on the left navigation bar to open the online agenda. The presentations are linked to each presenter’s name. Click on the presenter’s name for the presentation you want to download. The presentations will be linked to the agenda on this online registration site as soon as they are received. Please keep checking the website for further postings. Every year, programs around the globe utilize March 24th, World TB Day to highlight the continuing threat of tuberculosis to individuals and national health. Click below to visit the CDC website and find out what you can do, or participate in, to raise the awareness of the impact of TB to today's national and global health. The International Union Against TB and Lung Disease North American Region (IUATLD NAR) held its 14th annual conference in Orlando, Florida March 11-13, 2010. In conjunction with the IUATLD's NAR annual conference in Orlando, Florida; the four Regional Training and Medical Consultation Centers held a free pre-conference course entitled TB/HIV Updates on March 10, 2010 from 1:00- 5:00 pm. World renowned experts shared the latest information on: The Challenging Epidemic of TB/HIV; TB/HIV Clinical Management Overview; Case Management Issues in the Co-infected Patient; Drug-Drug Interactions and Issues Related to TB Drugs in HIV Patients; TB Infection Control in TB/HIV; and New IGRA Guidelines and IGRAs in Special Populations. The 2010 Training Calendar for Heartland has been posted to the Training Page. Please check frequently for updates as scheduling changes with our partners may occur. COMPLETED Regional Webinar: MDR TB Updates-Missouri Rehabilitation Center :: October 21, 2009 :: 12:00-1:30 PM CT.
COMPLETED-NATIONAL WEBINAR: TB Nucleic Acid Amplification Testing: New CDC Guidelines :: October 29, 2009 :: 12:00-1:30 PM CT.
Visit our Training page for the archived recording information. Heartland National TB Center would like to announce the addition of Alisha Blair, LVN to our Medical Consultation team. Alisha comes to Heartland from San Antonio's City Chest Clinic where she managed clients with latent tuberculosis infection or suspected of having TB disease. Alisha also provided assessment and clearances for clients from special populations, such as refugees, homeless shelters, and drug/alcohol abuse centers. Alisha has worked in public health with a concentration in TB since 2007, and we are excited to have her as an addition to the Heartland team. You may contact Alisha at 210-531-4546 or alisha.blair@uthct.edu. Download our new product: Impact of Poor Nutrition on TB Relapse. Prints double-sided, flipchart orientation (6.33" W x 13.58" H). No continuing education credits will be available for viewing the presentation via the website. If you have any questions, please contact laura.muraida@uthct.edu at 210-531-4509. Introducing the new Heartland Training Calendar Page. This interactive calendar, using month-by-month format, allows the user to navigate the current and previous years to locate dates of Heartland trainings. Clicking on a highlighted date brings up a small pop-up window that gives the course title. Clicking on the title takes the user to a new window that gives a course description, staff contact, and the training location. You can further navigate to the training brochure. If the course is in the future and registration is open, a link is provided allowing the user to go directly to the online registration form. This national webinar is now archived on the Heartland website. It is available for viewing; the accompanying PDF of the PowerPoint slides may be printed to follow along. The presentations can be viewed in Windows Media Player; special viewing steps are required. For technical questions, please email Eddie McHam at eddie.mcham@uthct.edu; for all others, email Jessica Quintero at jessica.quintero@uthct.edu. This webinar is now archived on the Heartland website. It, along with a PDF of the PowerPoint slides, is available for viewing or printing. The recorded presentation can be viewed in Windows Media Player. No CME or CNE credits will be awarded for viewing the archived presentation. For questions, please email HNTC@uthct.edu. The recorded presentation can be viewed in Windows Media Player. Archived video presentations may take a few minutes to load. No continuing credits are available for viewing these presentations. The CDC publication warehouse is now open. To order CDC TB publications, please use the online ordering system at https://www2.cdc.gov/nchstp_od/piweb/tborderform.asp. Most publications are also available on the CDC Division of Tuberculosis Elimination website at http://www.cdc.gov/tb. Download TB at a Glance, which is available on our Products page. Download our REVISED Tuberculosis Treatment Guidelines - 2003 (Poster), which is also available on our Products page. NOW AVAILABLE: TB Core Reference Set for Clinicians Set CD-ROM! This CD-ROM provides an array of documents and resources with the latest information on tuberculosis. These resources will assist the clinician in making the appropriate diagnosis and treatment plan for adults and children based on guidelines from the Centers for Disease Control and Prevention (CDC), American Academy of Pediatrics, American Thoracic Society, Francis J. Curry National TB Center, and Infectious Diseases Society of America (IDSA). To obtain this CD, please download and complete our Product Request Form. Then email or fax the form to Delfina Sanchez at delfina.sanchez@uthct.edu or 210-531-4590. Questions of Interest page now available here! Heartland staff answers the more unusual questions of tuberculosis diagnosis, treatment, and patient management. Answers to each question are provided as PDF documents, so you will need the Adobe Reader to view. No continuing education credits are available for viewing these presentations.